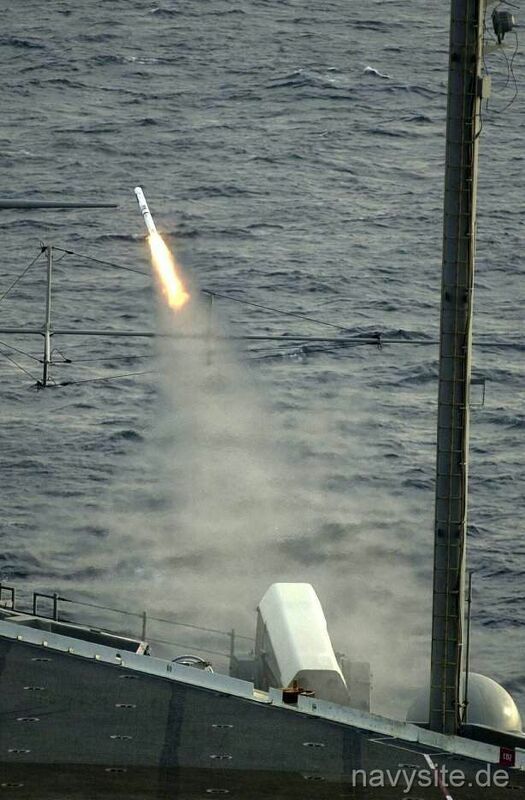 The RAM program is designed to provide surface ships with an effective, low-cost, lightweight, self-defense system which will provide an improved capability to engage and defeat incoming antiship cruise missiles (ASCMs). 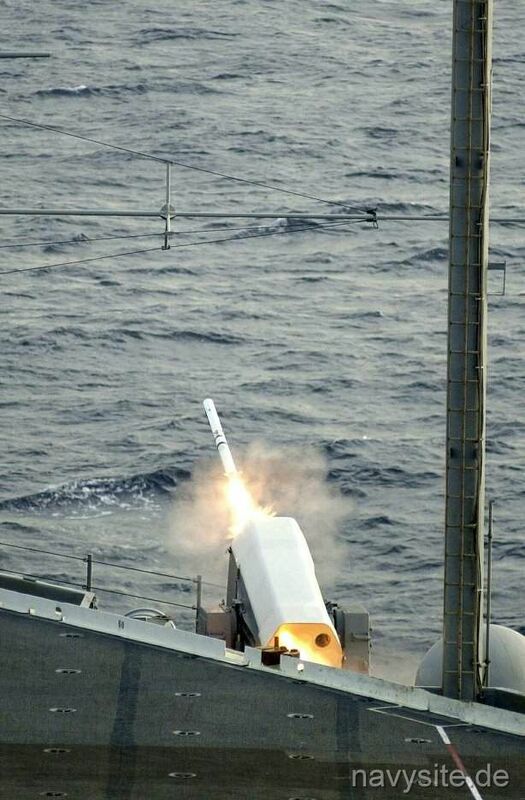 RAM - a joint US and German project - is an autonomous fire-and-forget inner-layer air defense missile system which will increase the survivability of otherwise undefended ships. RIM-116 is a 5-inch missile that utilizes SIDEWINDER technology for the warhead and rocket motor, and the STINGER missile’s seeker. The launching system - a 21-round or a 11-round launcher - and the missiles comprise the weapon system. The RAM Block 0 has a 5-inch diameter airframe that rolls in flight and dual mode, passive radio frequency/infrared (RF/IR) guidance. Initial homing for RAM Block 0 is in RF, using an ASCM's RF seeker emissions. If the ASCM's IR radiation is acquired, RAM transitions to IR guidance. Operational Evaluation (OPEVAL) of RAM Block 0 was conducted from January to April 1990. It was assessed to be potentially operationally effective and potentially operationally suitable, but there were shortfalls in its ability to handle, under all environmental and tactical conditions, the full spectrum of threats. In April 1993, a decision was made to pursue rectification of OPEVAL deficiencies by implementing a block upgrade. RAM Block 1 is the upgraded missile. Effective against a wide spectrum of existing threats, the RAM Block 1 IR upgrade incorporates a new IR "all-the-way-homing" guidance mode to improve AW performance against evolving passive and active ASCMs. The Block 1 missile retains all capabilities of the Block 0 missile while adding two guidance modes, IR only and IR Dual Mode Enable (IRDM). The IR only mode guides on the IR signature of the ASCM. The IRDM will guide on the IR signature of the ASCM while retaining the capability of utilizing RF guidance if the ASCM RF signature becomes adequate to guide on. RAM Block I can be launched in an IR all-the-way mode, as well as the dual mode (passive RF, followed by passive IR) used by Block 0. The Block 1 upgrade program was successfully completed in August 1999 with a series of operational tests to demonstrate the system's introduction maturity. In 10 scenarios, real Anti-Ship Missiles and supersonic Vandal target missiles (Mach 2.5) were intercepted and destroyed under realistic conditions. 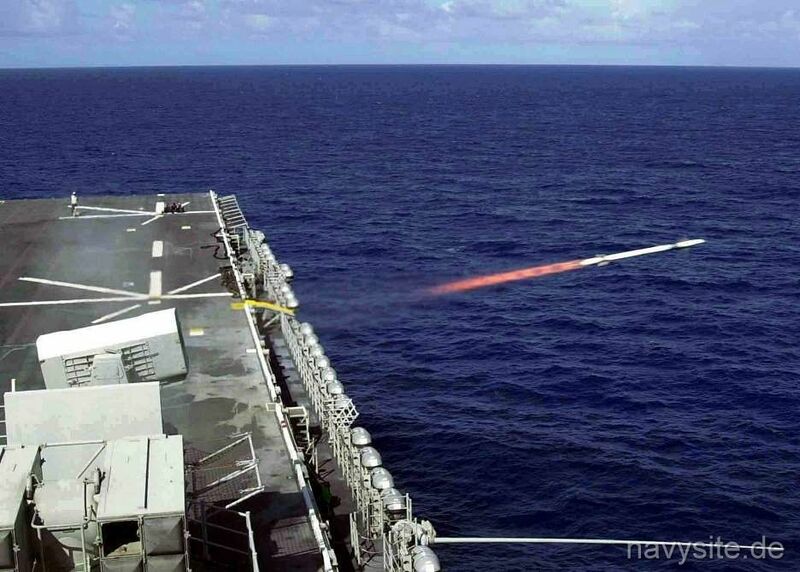 RAM Block 1 achieved first-shot kills on every target in its presented scenarios, including sea-skimming, diving and highly maneuvering profiles in both single and stream attacks. With these test firings RAM demonstrated its unparalleled success against today's most challenging threats. Cumulatively to date more than 180 missiles have been fired against anti-ship missiles and other targets, achieving a success rate over 95%. 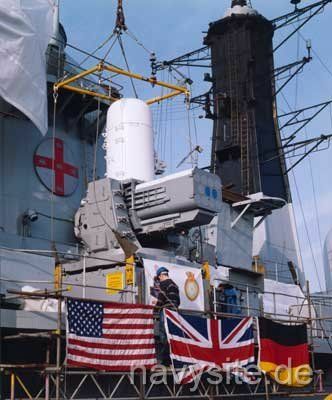 RAM has been in production since 1989 and is now operational on more than 60 ships of the German and US Navies. Greece and Korea have also signed procurement contracts, initially for 3 each of the RAM Launching Systems. 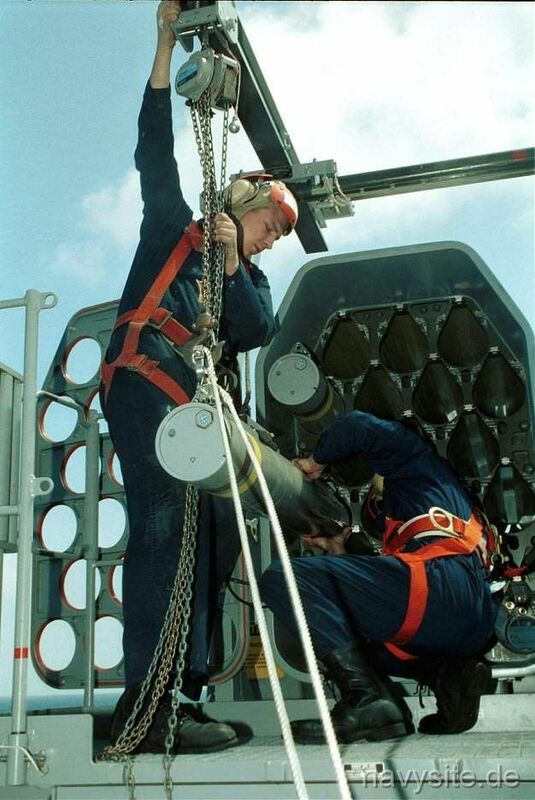 Based on the results of operational testing conducted aboard the USS GUNSTON HALL (LSD 44) in January 1999 and the Self-Defense Test Ship between March and August 1999, the Commander, Operational Test and Evaluation Force, declared the RAM Block I to be operationally effective against a variety of cruise missile threats and recommended fleet introduction. The Block I missile had successful intercepts in 23 of 24 development test firings. A full-rate production decision occurred in January 2000. As of March 2000, RAM Block I has been installed on two LSD class ships and is pending installation on two LSD 41 class ships, LHD 7, and CVN 76. Navy installation plans call for Block I installations or upgrades on 8 LSD 41/49, 3 DD 963, 12 CV/CVN, 7 LHD, and 12 LPD 17 (new construction) ships between 2001 and 2006. Though not yet funded, the Navy also plans to install RAM Block I upgrades on all five LHA class ships during fiscal year 2007. In November 1998, the United States and Germany amended the Block I development Memorandum of Understanding to include scope and funding for the development of a helicopter/aircraft/surface craft (HAS) upgrade of the RAM missile. Requiring only software changes to the RAM Block I missile, the HAS upgrade will extend RAM targets to include helicopters, aircraft, and surface ships. Navy plans indicate that all RAM installations on LSDs, LHDs, LPDs, and CV/CVNs will be the HAS configuration by 2009. 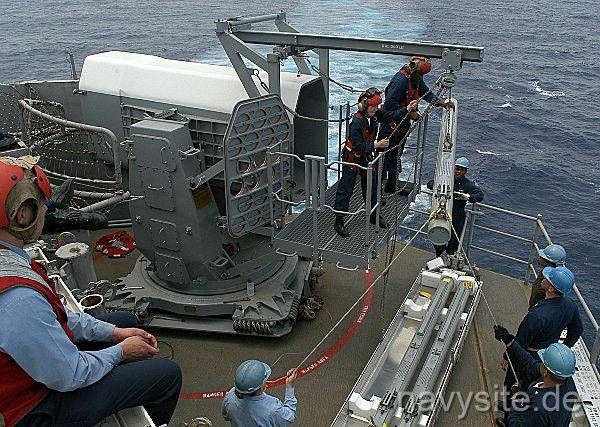 Also, the Navy is developing an 11-round guided missile launcher in the HAS mode configuration for installation on CG 52 through 73 between 2004 and 2009. The first US fleet firing of the RAM occurred in October 1995 from the USS PELELIU (LHA 5). 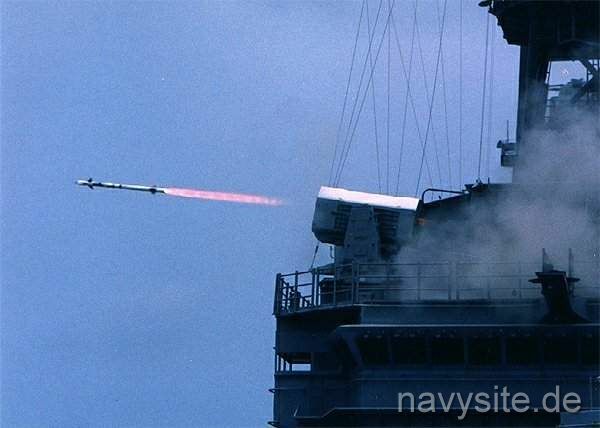 On March 21, 2002, USS KITTY HAWK (CV 63) became the first aircraft carrier in the US Navy to perform test firings with the Rolling Airframe Missile System. 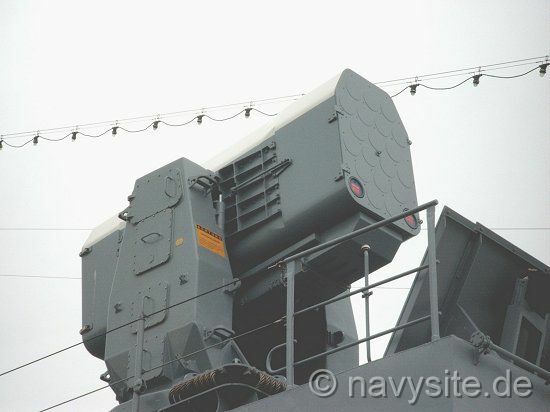 RAM weapon systems are integrated with the AN/SWY-2 combat system on certain ships and as part of the Ship Self Defense System (SSDS) on other ships (LSD-41 class ships at this time). The AN/SWY-2 is comprised of the weapon system and the combat direction system. The combat direction system employs the existing Mk 23 target acquisition system (TAS) radar and the AN/SLQ-32(V) electronic warfare support sensor together with threat evaluation and weapons assignment software resident in the Mk 23 TAS to accomplish threat detection, correlation, evaluation, and engagement. With SSDS, RAM is part of the engagement suite. For example, on LSD 41-class ships, a typical SSDS engagement suite includes RAM, the Phalanx Close-In Weapon System Block 1A, and the decoy launch system. SSDS further integrates the AN/SPS-49(V)1 radar with the medium PRF upgrade, the AN/SPS-67 surface search radar, the AN/SLQ-32(V) sensor, and the CIWS search radar. 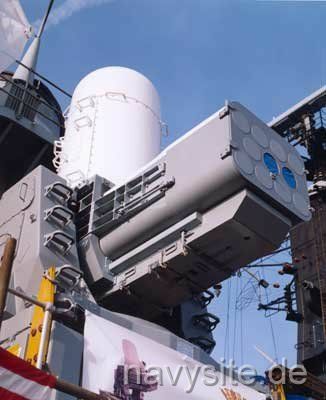 The SEA RAM Anti-Ship Missile Defense System under development by RSC and RAMSYS is an evolved Close-In Weapon System (CIWS) comprising key attributes of both the existing Phalanx CIWS and the RAM Guided Missile Weapon System. 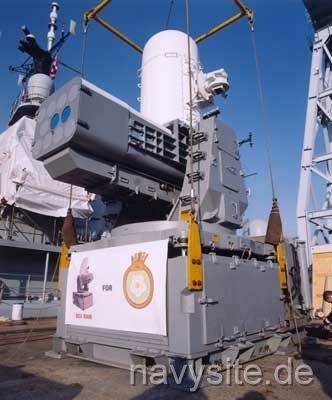 SEA RAM is designed to extend the battle space of the CIWS and enable the ship to effectively engage multiple targets. Leveraged technology from Phalanx and RAM integrates elements of each system into the self-contained SEA RAM System. 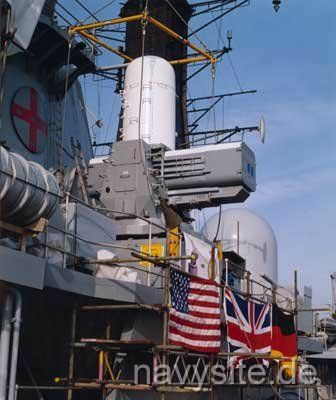 An 11-missile round RAM guide assembly, loaded with RAM Block 1 guided missiles, replaces the 20 mm gun of Phalanx. SEA RAM combines the superior accuracy, large intercept range and high maneuverability of RAM with the high resolution search-and-track sensor system and reliable quick response capability of Phalanx Block 1B. On February 1, 2001, SEA RAM was successfully landed aboard the Royal Navy destroyer HMS YORK for trials. Back. Back to Missile List. Back to selection page. Back to 1st page.